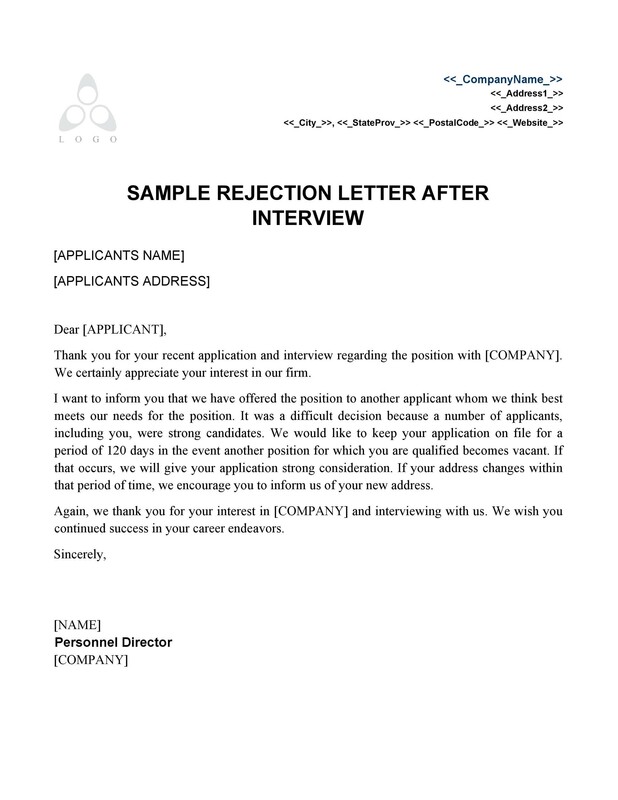 Never take rejection letters in a negative light whether you’re an applicant or a company. Instead, consider it as an act of professionalism on both parties. 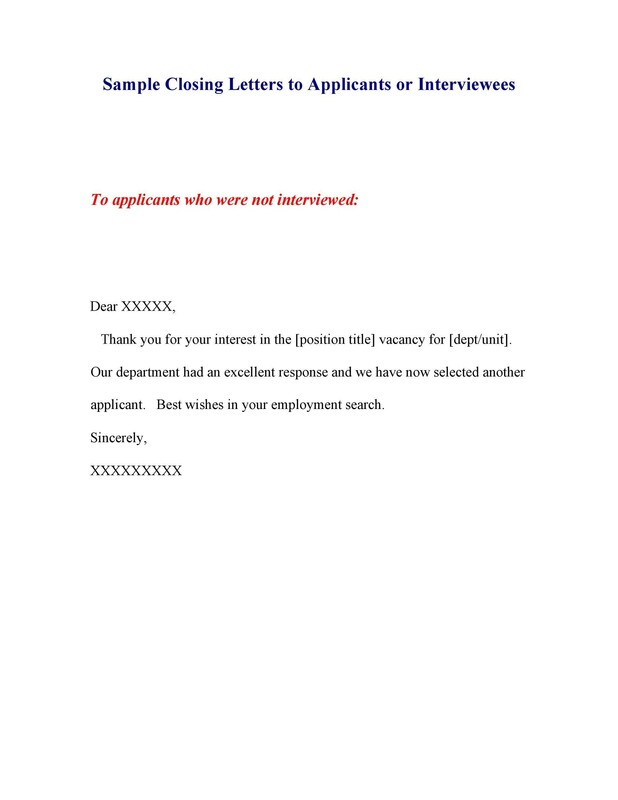 The company sends the letter to inform the applicant that they’ve studied the request. Unfortunately, there are others who are more qualified. 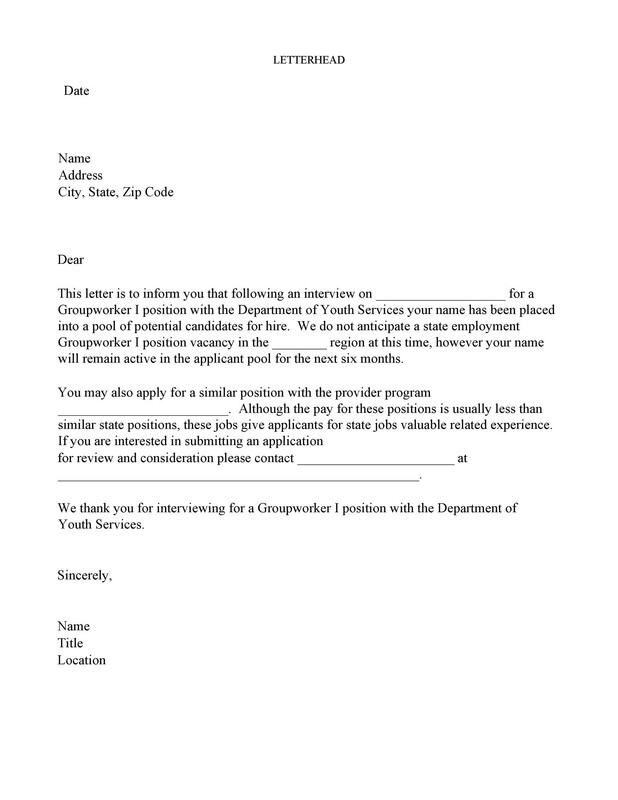 The applicant, in turn, would recognize the courtesy the company considered him. Although sending the letter isn’t a requirement, it’s an act of courtesy. The company may have chosen the best qualified. 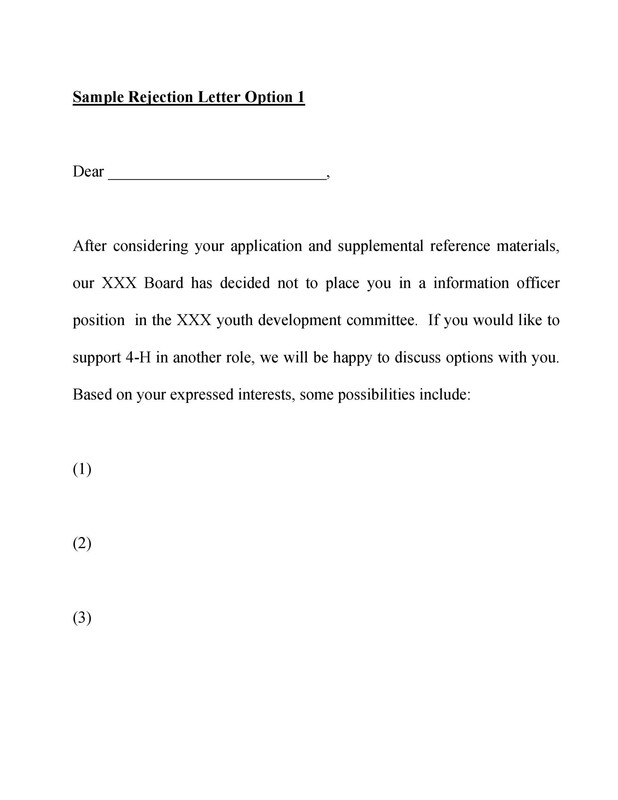 But without the letter, it would leave the rejected applicants in the dark. 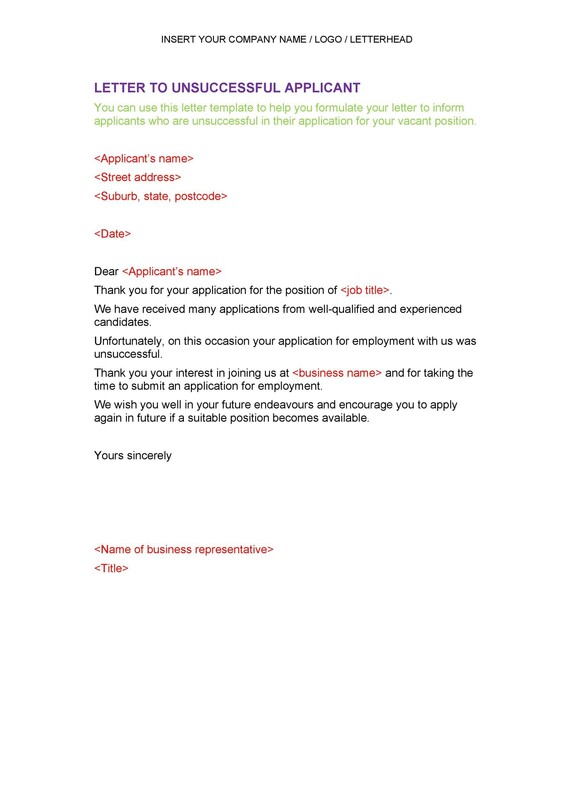 The job rejection letter would give the applicants time to consider their next move. 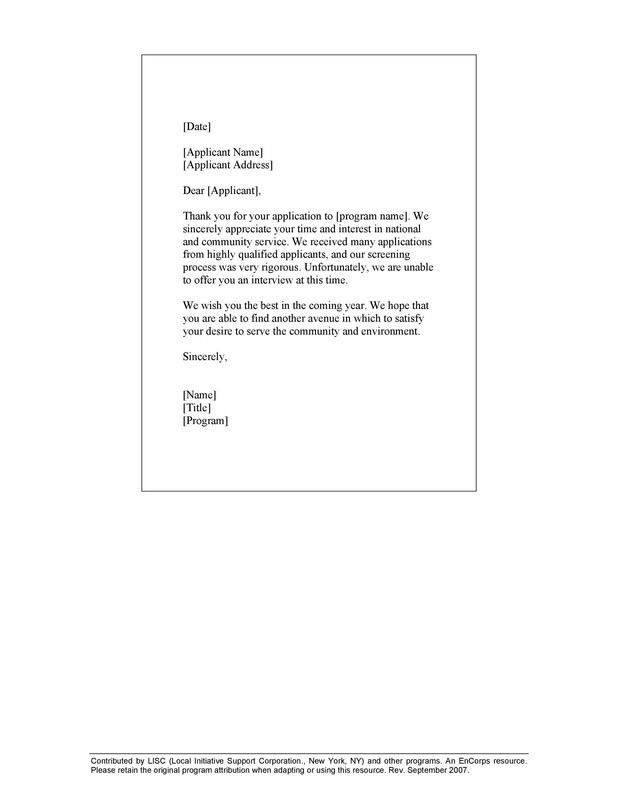 Such rejection letter samples would build a good reputation for the company. In the long-run, it can help attract the best talents in their search. Candidates, too, will remember how companies have treated them. It’s difficult not to have any notification about the status of their application. It will be a reflection of the company’s policies. 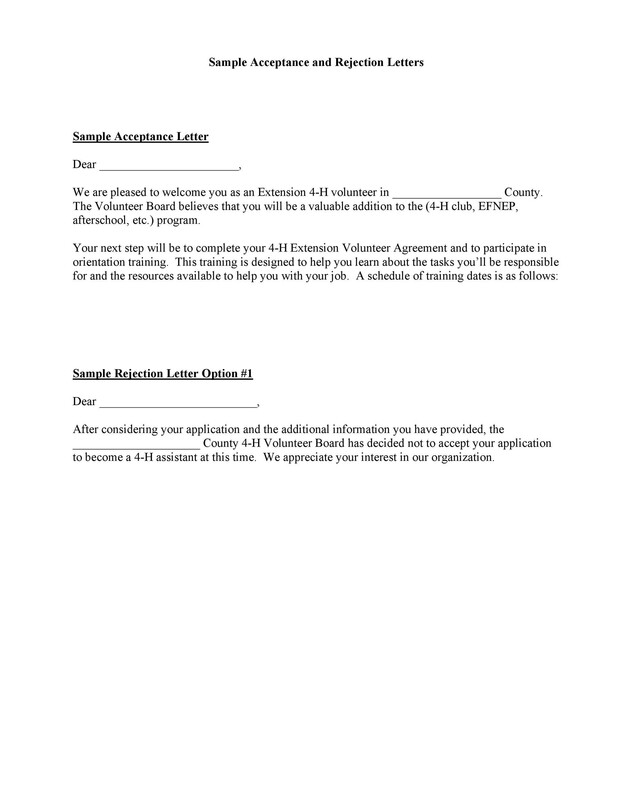 It won’t do them any favors regarding their decisions on dealing with applicants. 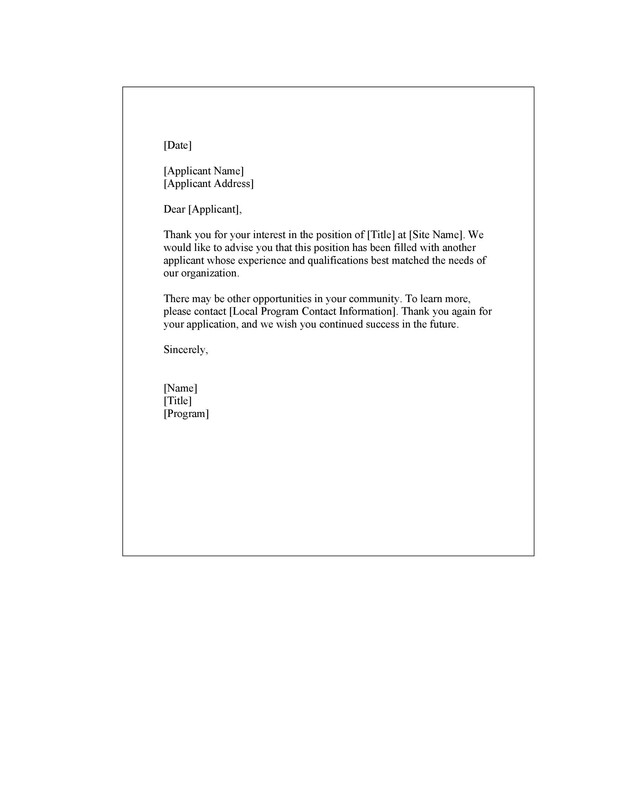 Sometimes in considering applicants, the rejection letter template is the final notice. 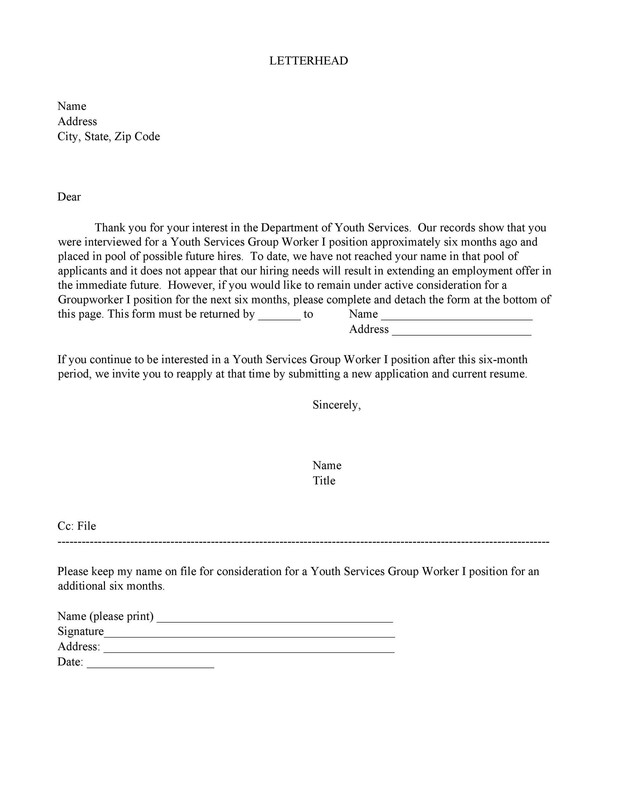 Prior to that, the applicants can go through interviews, background checks, and more. 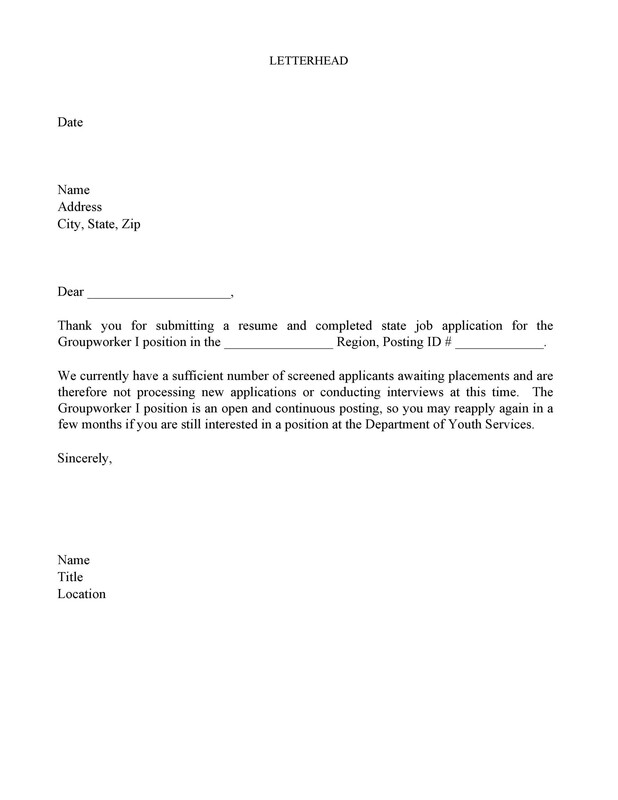 The process would be filtering out the applicants in order the get the best and most qualified. 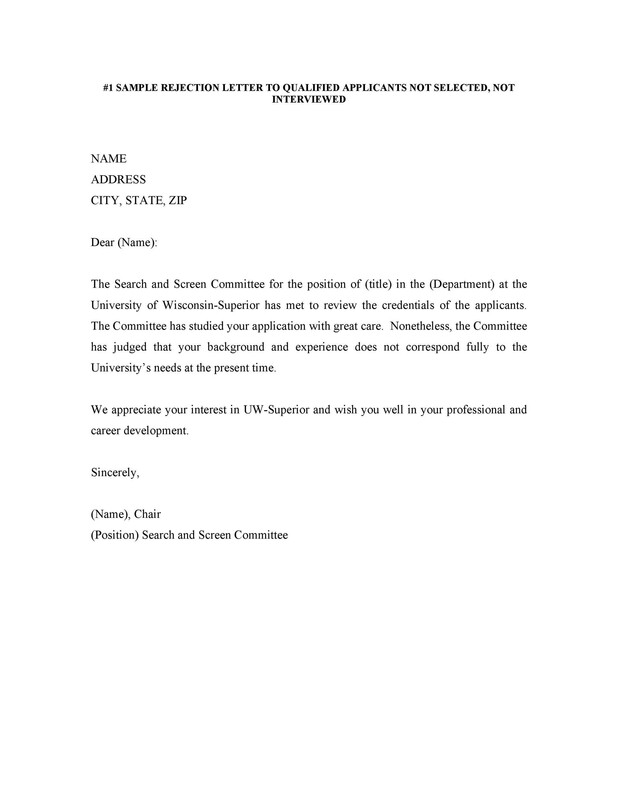 When the final decision’s done, then the candidate rejection letter comes into play. The Human Resources Department is not only tasked with dealing with the grievances. They’re also involved in the hiring process. As a consequence of this, they will be writing the candidate rejection letters. They’ll give it to the less qualified applicants for the sought position. 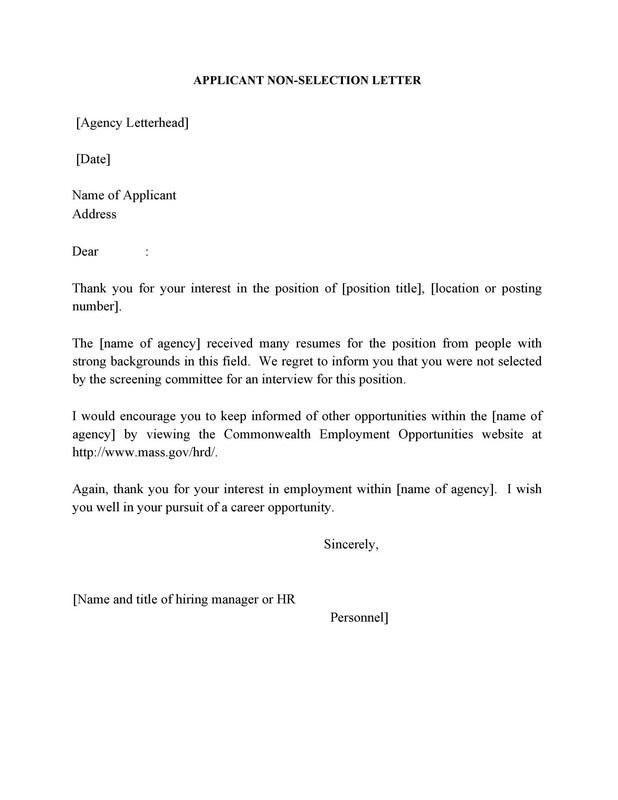 With the many tasks at hand, HR would rather rely on rejection letters templates which could save them time, effort, and cost. 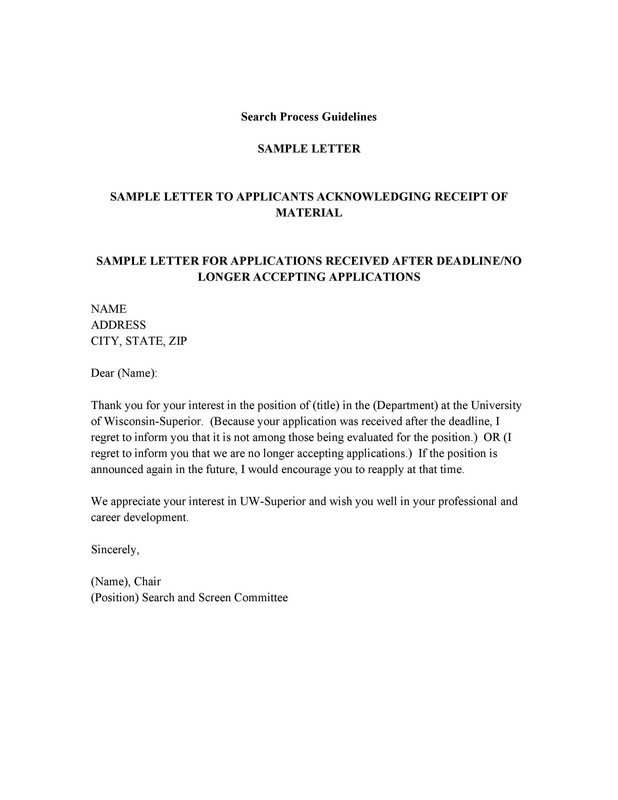 Rejection letter samples can address several situations like applications and grievances. Often times, rejecting a request could be quite uncomfortable. This is especially true against applicants who rank next in the ladder. The template is the best solution rather than composing one. Download a template here and make changes to suit your requirements, if necessary. 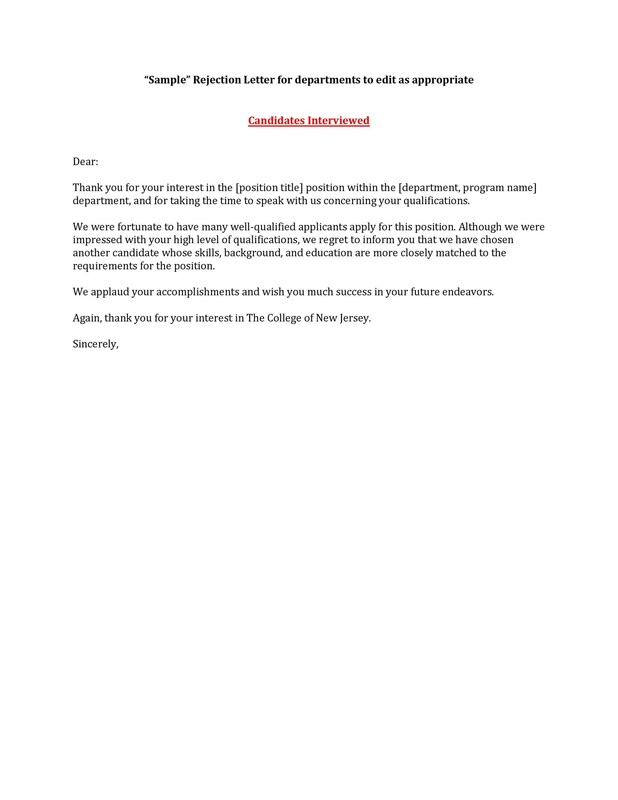 A rejection letter can cut both ways. It could come from a candidate selected for a position but declined the offer. 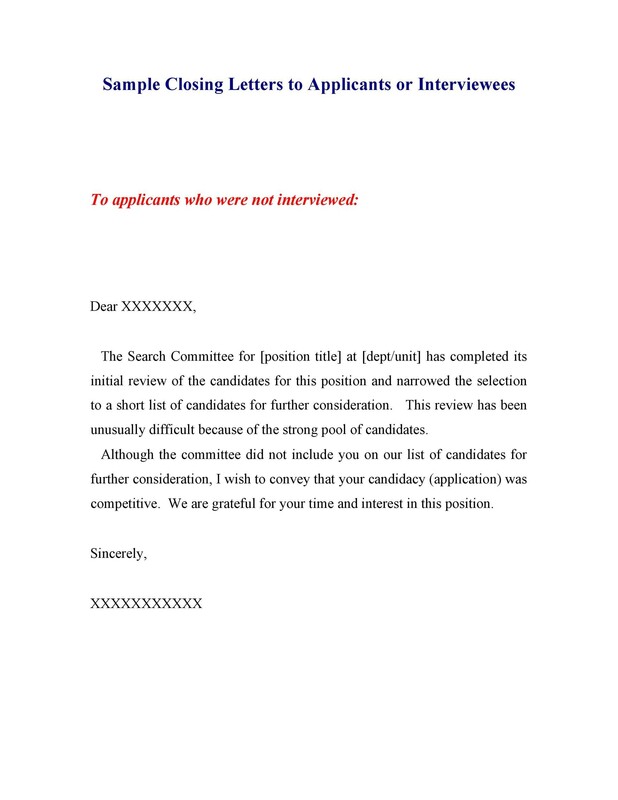 The candidate should also follow protocol when composing such a letter. Professionalism should always be part of the letter, meaning it should be polite. Whatever reason the candidate has, it should be tactfully expressed. There’s no need to mention about a better salary offer by another company. Also, avoid negativism against other company employees or the like. 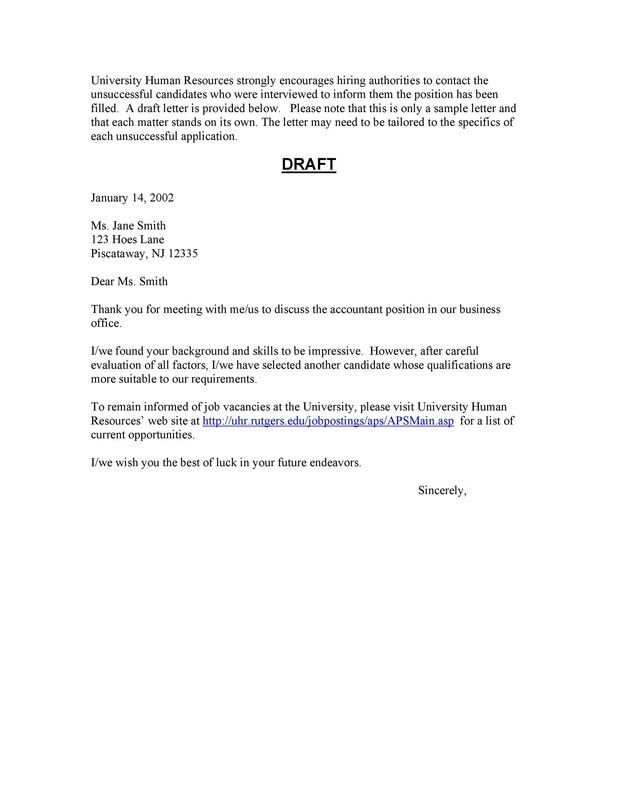 Think about how to write a rejection letter. It should carry a formal tone with the proper salutations and should end on a thankful note. The candidate should express appreciation for the position. Include this even if you have to decline for personal reasons. 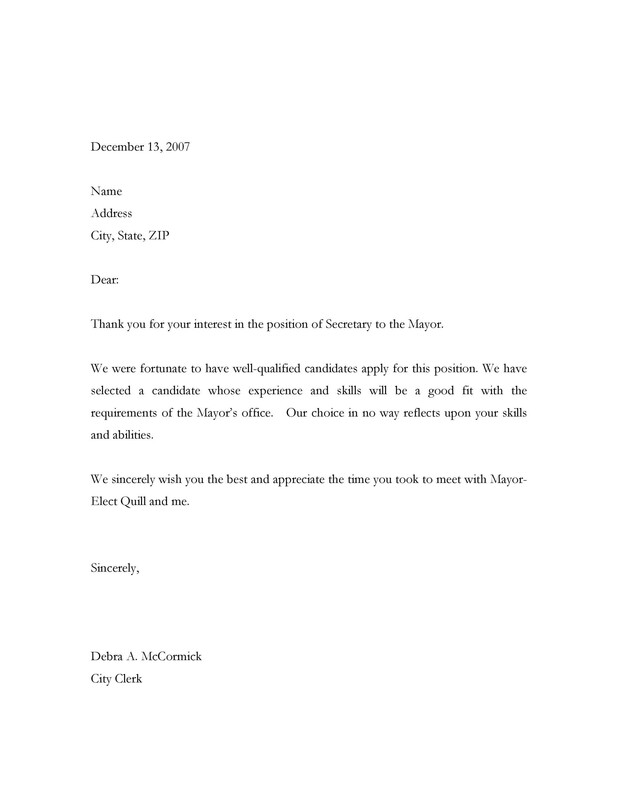 For bypassed candidates, their letters should also carry a polite and professional tone. Base the reason on qualification or non-qualification. It should never be about religion, caste, appearances or any discriminating factor. Never use a letter that’s harsh and negative. Rather, it should be positive and encouraging to try other options. A thank you statement at the end of the letter would be great. 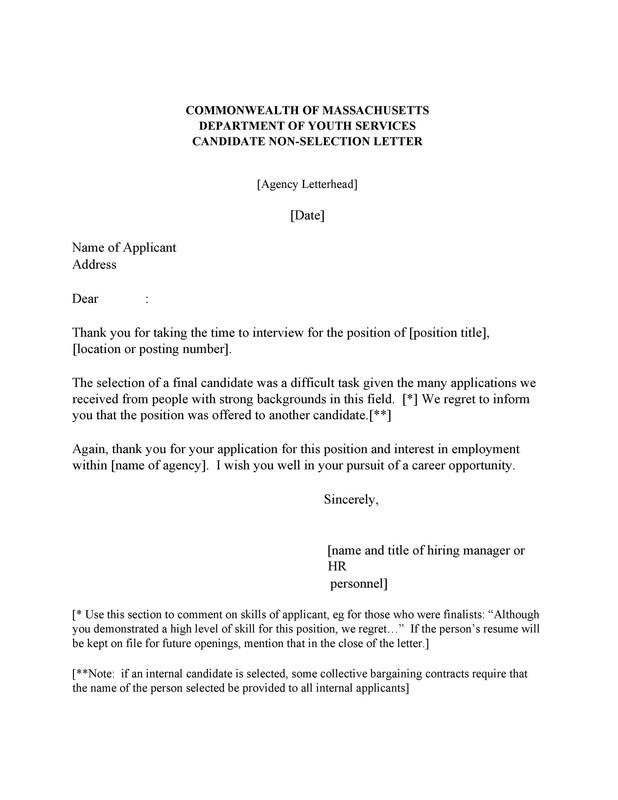 In the case of a candidate declining an offer, the letter is a way of showing gratitude. You can even say that at some future time, you might want to work for the company. Positivity should always show in such a letter. If the candidate declines the offer, he should still express gratitude. He should appreciate the process by which the company has subjected him. 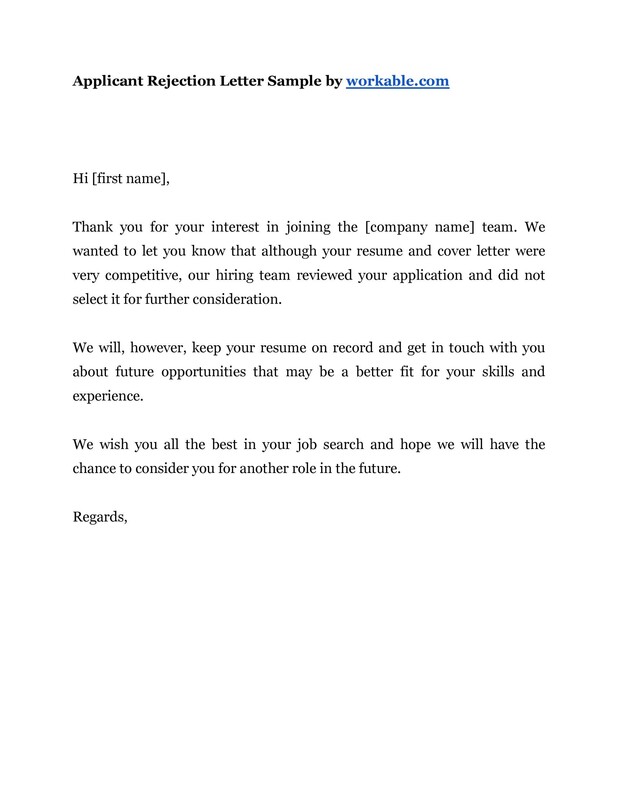 If a company sends a letter to reject a candidate, it shouldn’t be because of personal reasons. Such letters are important. 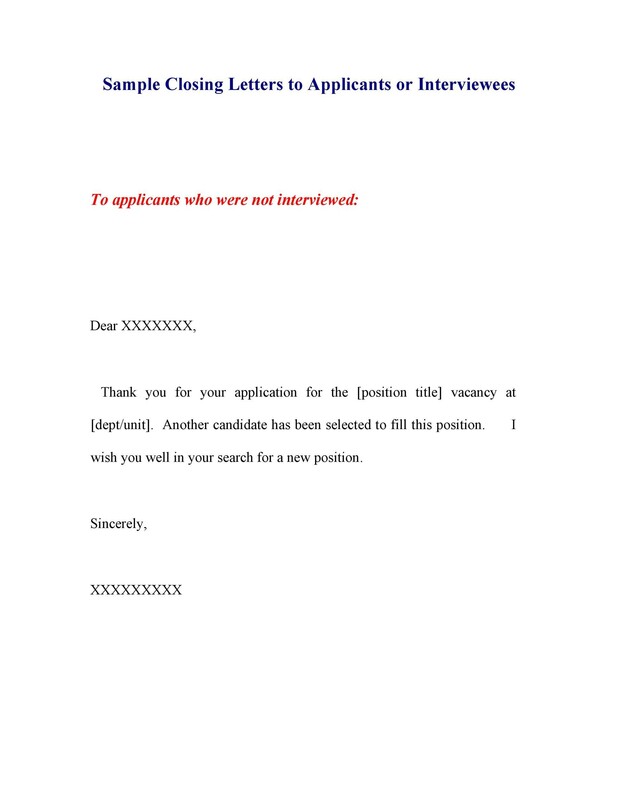 They are means of communicating the interest of both the candidates and the company. This is especially true if they’re written with a degree of professionalism. We all know the frustrations when turned down for a prospective job. You’ve spent time and effort on the application letter, interviews, and more. So it would be disheartening to bring the bad news to you as a candidate. This is true, especially for recruiters who would be delivering the punch. Even those who send the letters could feel some discomfort. Nobody wants to be bearers of such information. 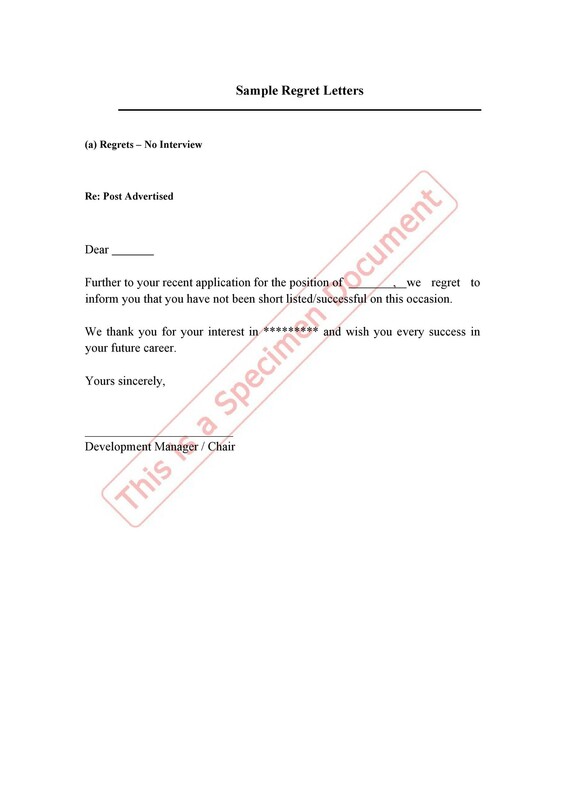 This may be the reason why many rejection letter templates are cold and shrouded in mystery. There’s nothing worse for an optimistic candidate than rejection, even more so after going through the process with flying colors. 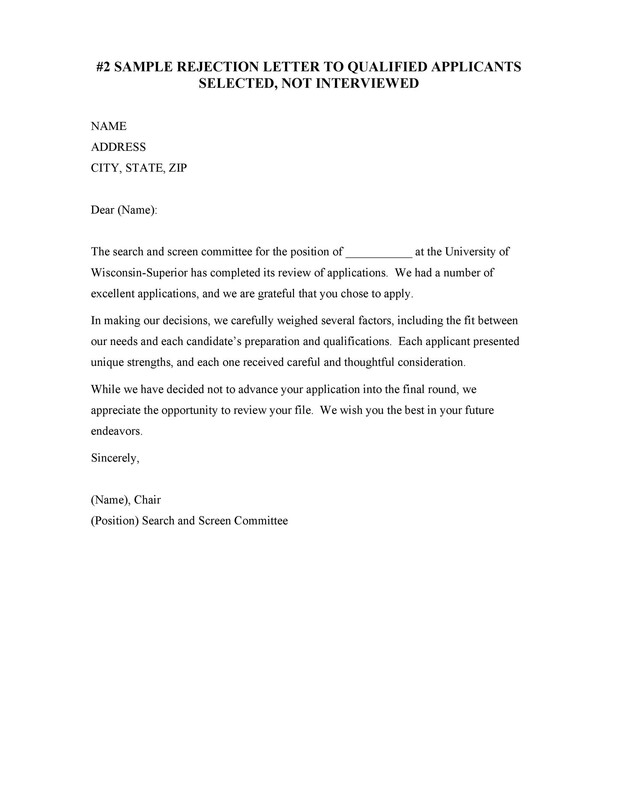 Consider how to write a rejection letter. You can make it easier for the recipients if you add a humane element. A few minutes of the writer’s time is enough to inject words of empathy into the letter. It’s within the bounds of propriety to accord respect to people who get rejection letters. Be more personal and don’t make the letter sound routinized and robotic. Inject some emotion and understanding into it. Show your appreciation for the candidate’s efforts in undergoing the process. Give words of encouragement to pursue their careers with other companies. It’s so difficult to choose the most qualified candidates. This is especially true if they’re similar to each other. You have to exclude the runners-up, though worthy enough. Then you can tell them to keep in touch. Of course, these are empty words. As soon as they step out the door, you’re likely to forget them. Their resume will just be part of your pool of applicants. But many companies do give importance to rejected but qualified candidates. They will retain the candidate’s resumes and will get in touch with them in case of a vacancy. The phrasing of the sentences should be well-thought-out. This would give the candidate a feeling of importance. At the same time, the phrasing must be subtle enough in not committing any promises. In their quest for the position, the candidates will give all their efforts to achieve their goal. From the writing of the application letters to interviews, and several tests, this doesn’t even include the dressing up, travel time, and showing punctually. Such investments of time, energy, resources, and hope deserve more than just platitude. It’s proper to inform the candidates why they weren’t chosen. If they’re under-qualified, explain why. Make them understand why they don’t meet the company’s requirements. It will make it easier for them to accept the rejection. Scan through the candidate’s resume and performance when qualifying for the job. You can unlock somewhere in the files the candidate’s strongest points. Identify these strengths and complement the candidate on them. This should cushion the effects of rejection. When writing about these strengths in the letter, avoid using generic terms. Be honest in pointing out their specific strengths. Mention that they are worthy to be in some other company’s employment. No one is happy about rejection. So it’s important that you should not devalue or diminish the candidates. 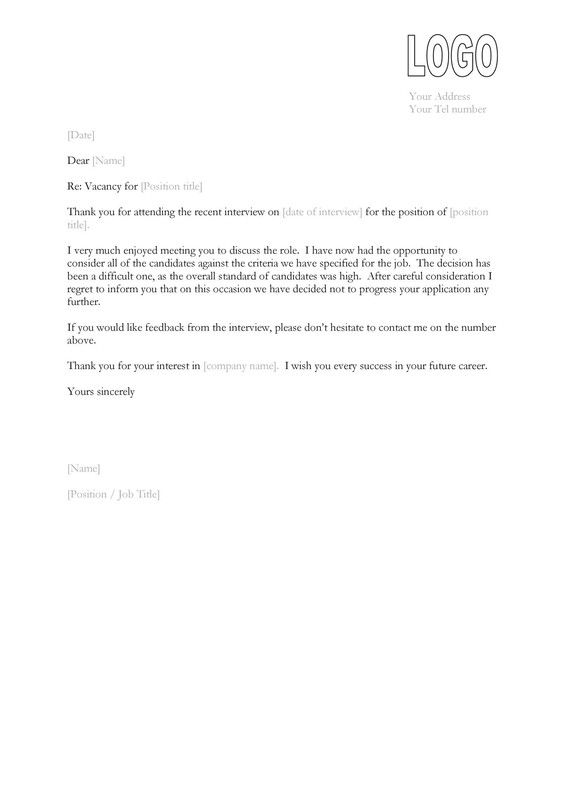 Guidelines in making job rejection letters always emphasize warmth and being forthcoming. If you can empathize with the candidate, delivering the bad news can be better. You can apply many clichés for candidates who haven’t qualified for a position. We have heard, “thanks but no thanks” or “don’t call us, we’ll call you.” But there are also those candidates who scored with exemplary marks. 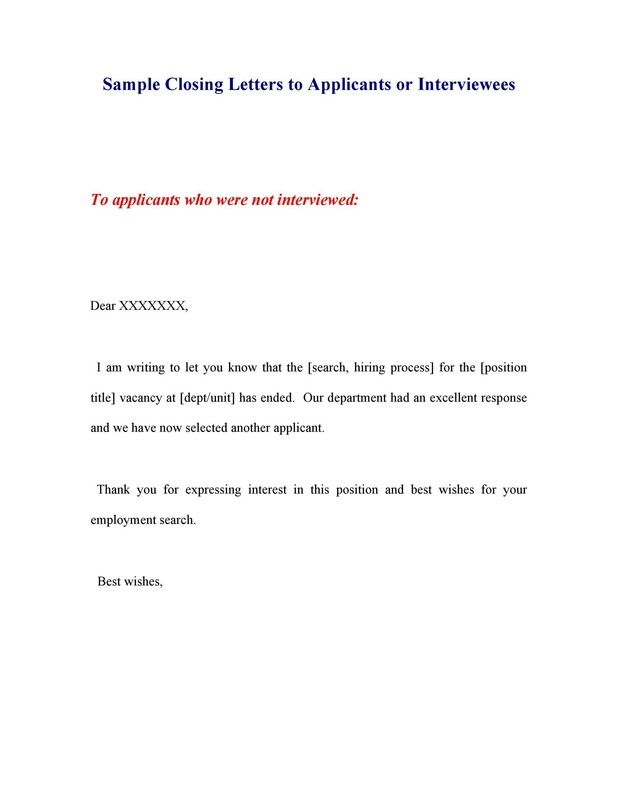 Your letter should end by thanking the applicant. Also, wish the applicants success in their future endeavors. 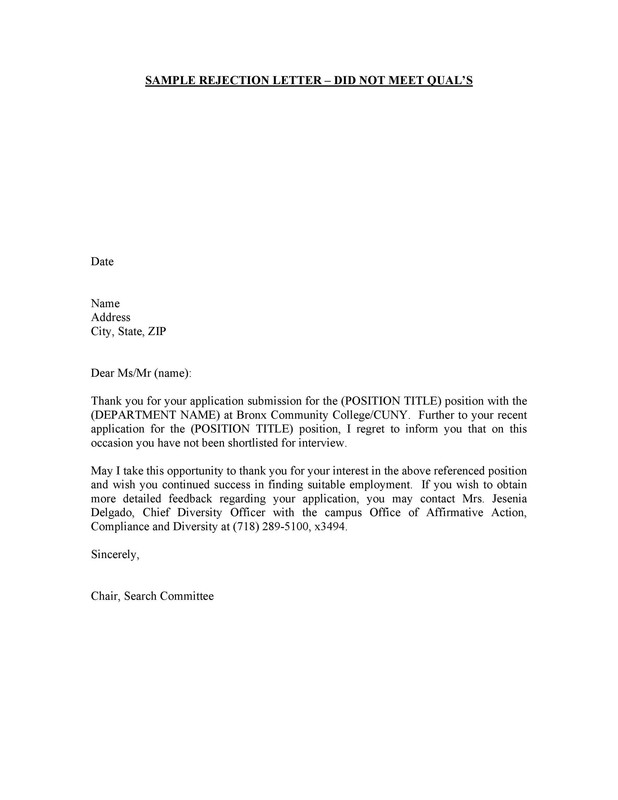 Add some personal touches about the candidate in the letter. 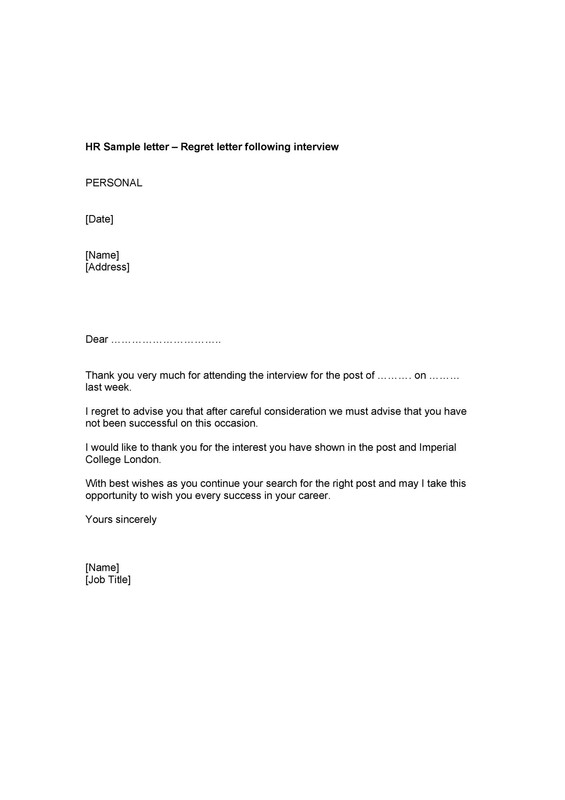 State the full name, position, and if possible, a note about the interview. Writing the letter in plain sentences would just be adding insult to the injury of rejection. 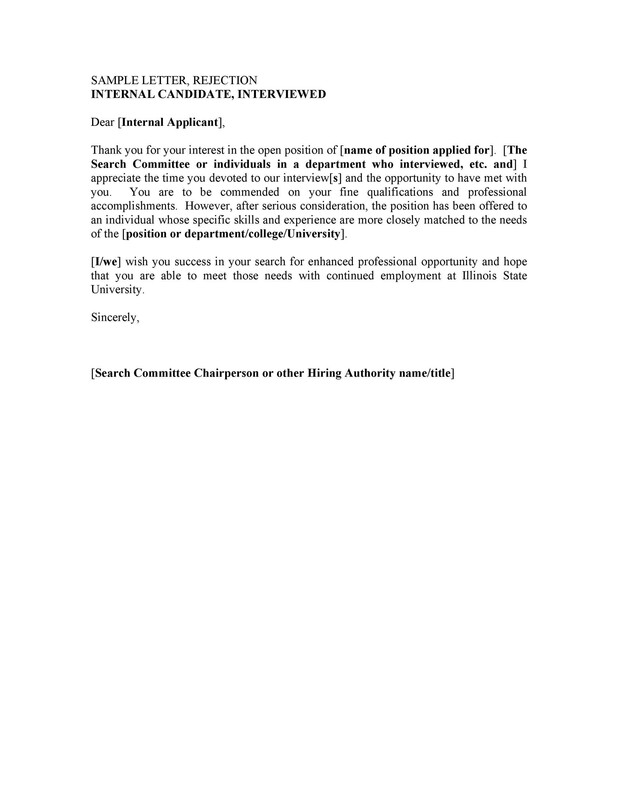 Make the letter as professional looking as possible. 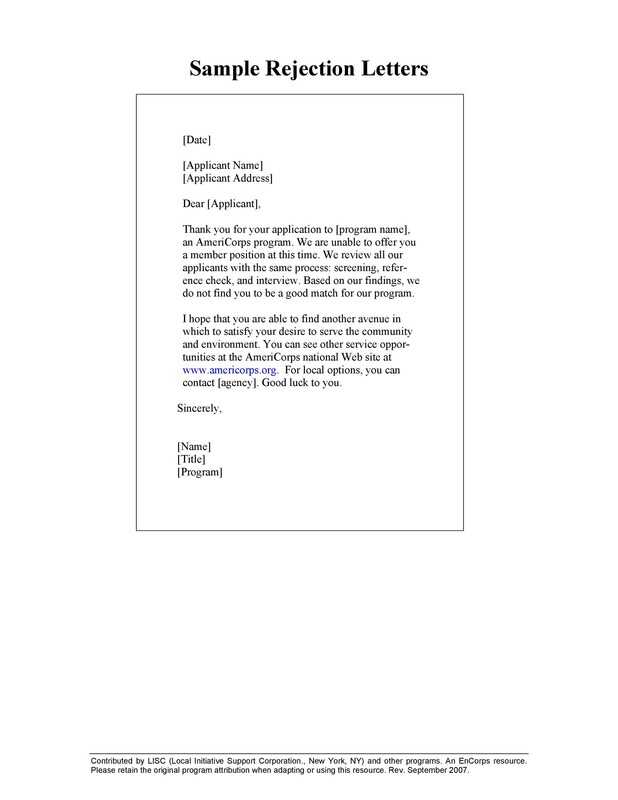 Even business letters can be gracious. 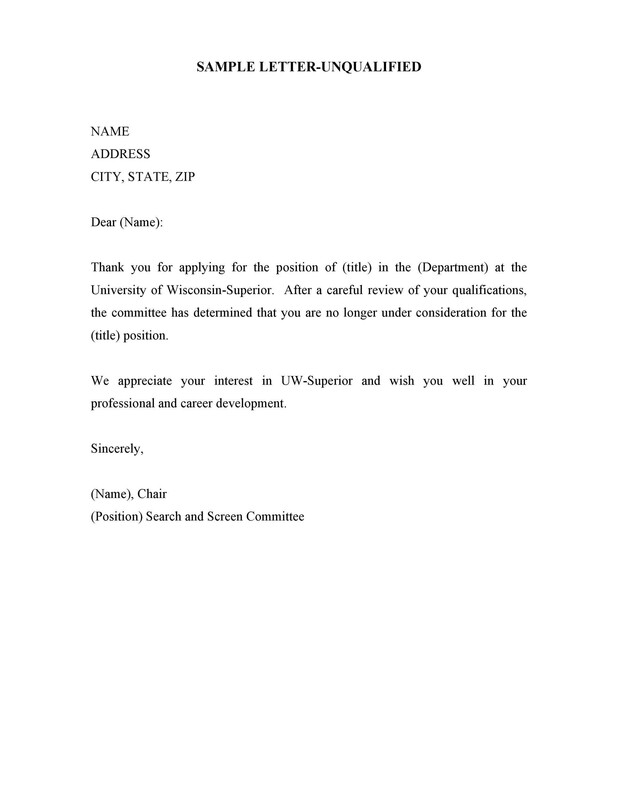 The letter has already pierced the candidate’s dream. 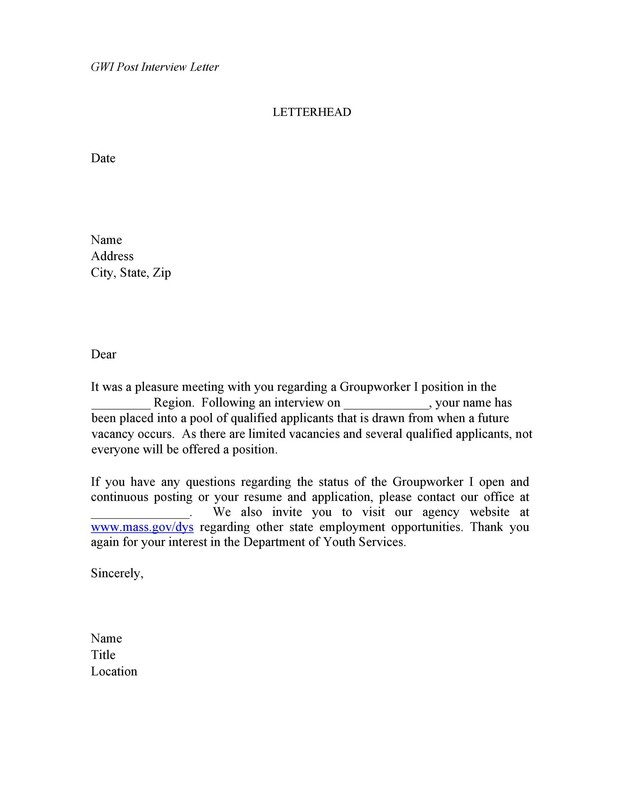 The best thing you can do is apply consideration and respect in the letter. Be honest when writing the letter. State only what’s true. 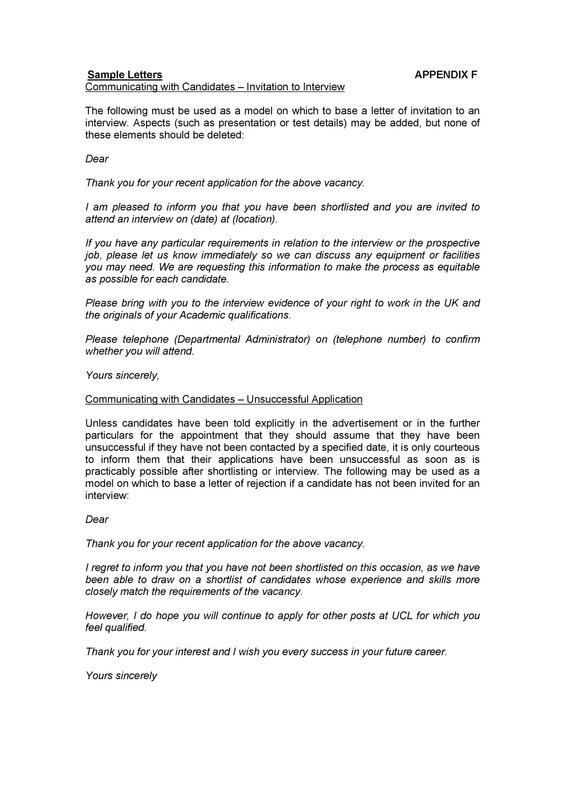 For instance, don’t encourage an unqualified candidate to re-apply. This is especially true when you know for sure that he will not qualify for the position. 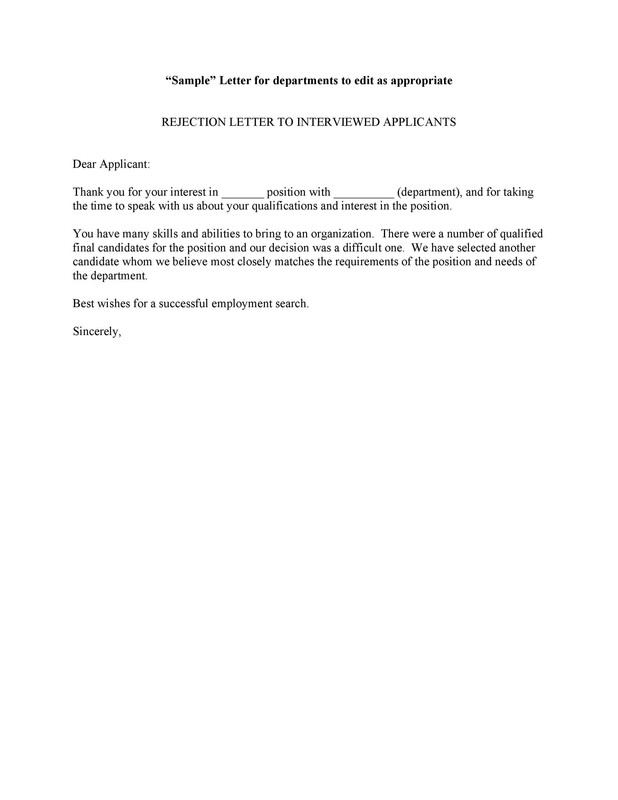 The letter is the last communication you will be having with the candidate. Make it meaningful. It’s the final opportunity for you to establish a relationship with the candidate. It will show that your company is very professional and very understanding. 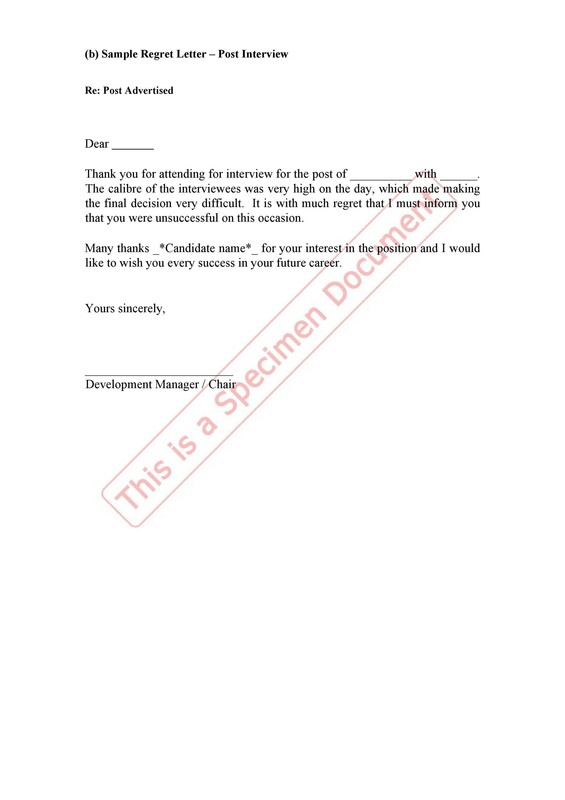 Treat the candidates fair and well and they can do the same to you when asked to comment about your company. 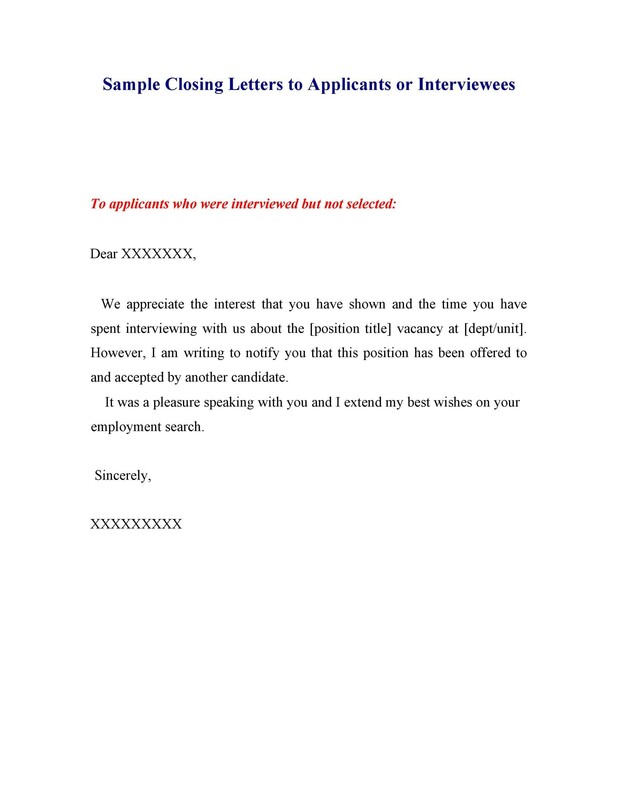 Sending candidate rejection letters is a sign of a professional company. But these letters can hurt, especially for candidates who believe they excelled. The candidate may ask some questions and beg for answers. Often times, this may even discourage one from making another application. For a new job seeker, this can be a great put-down. 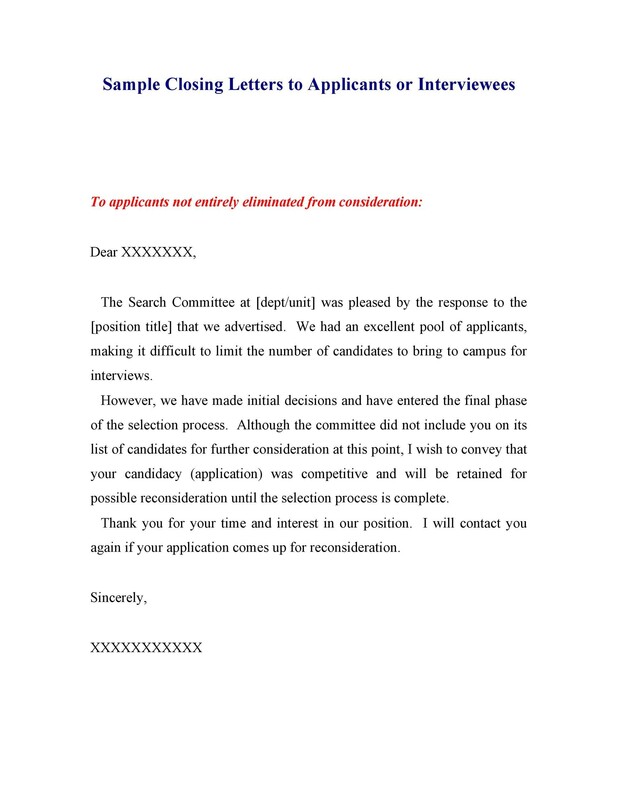 The tendency for a rejected candidate is to re-apply. This should not be the case. You know you excelled in that job you applied for and still will, but with a different company. You tested your abilities when you applied for that job. You made survived it, from the screening to the written and oral tests, to the interview. Obviously, you’re qualified for the job because you were doing things right. Maybe another candidate was fortunate or a little better than you. But that doesn’t mean you’re less qualified. 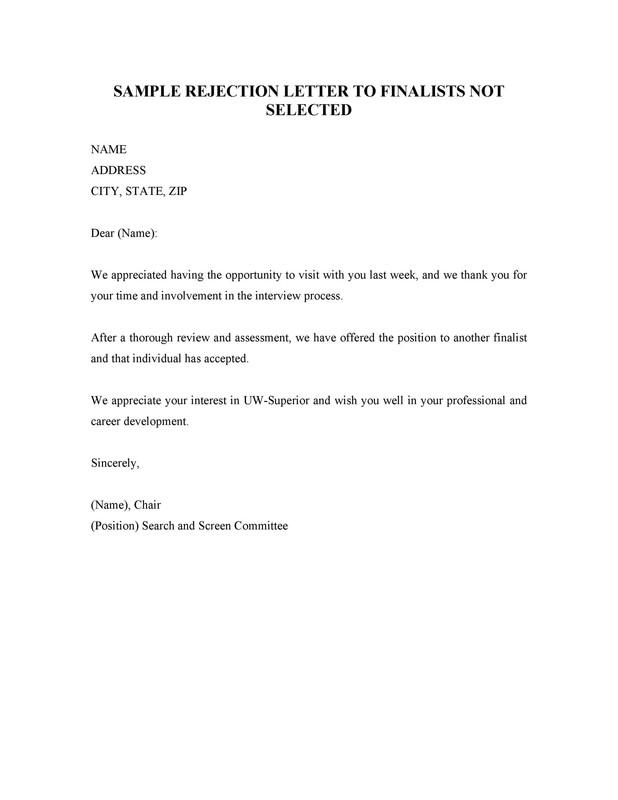 The letter isn’t a measure of your qualifications. Always bear in mind that you’re qualified. The company may have been in a dilemma. They may have found out that two candidates became finalists, one as good as the other. You may never know but maybe they gave the job to the other party by flipping a coin. The lesson here, never undervalue yourself. Usually, companies confronted when making such choices won’t close opportunities for qualified employees. They may think of some other position inside the company one which can benefit from your qualifications. That would also be productive on their part. They won’t have to go through the troubles of starting a search all over again. 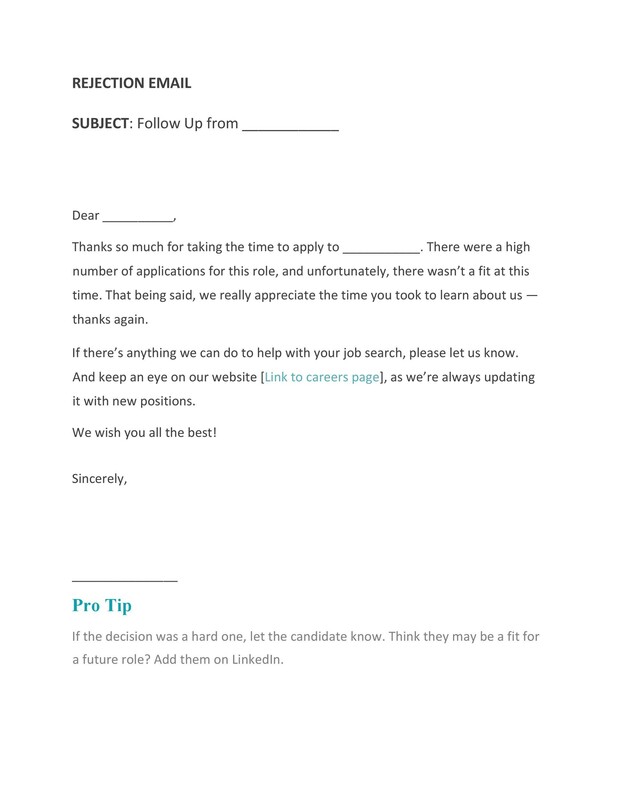 Some candidates do follow-ups on their applications. This means that they really want the offered job and they mean business. Managers should take note of these candidates. 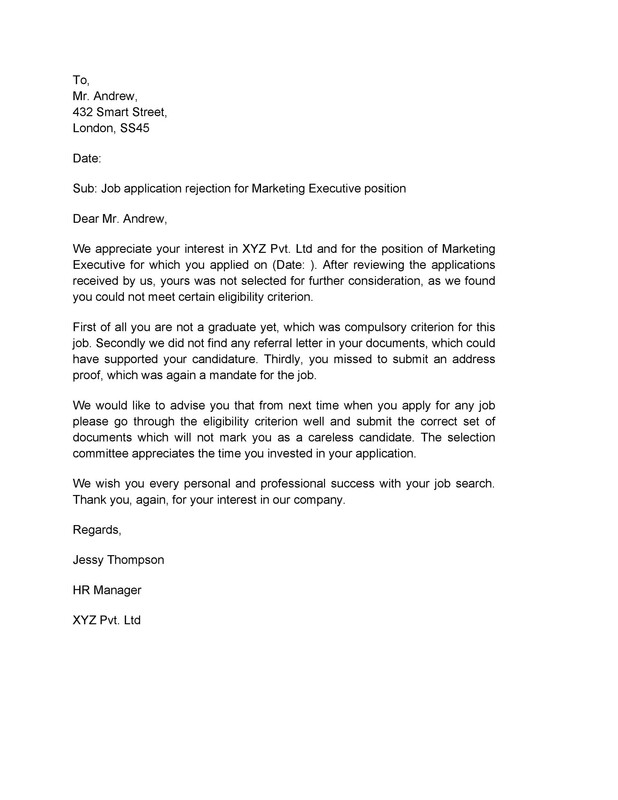 A rejection letter doesn’t mean that a candidate couldn’t qualify for the next job. Opportunities for qualified applicants will always find their foot on the door. For hiring managers, keeping a list of qualified candidates can be quite advantageous. Sometime after rejection, the manager could circle back to these contacts. Inform them they are being considered for different positions, if not now, maybe in the future. Such letters shouldn’t make you change what you’re doing. However, you may have already gone through several applications. 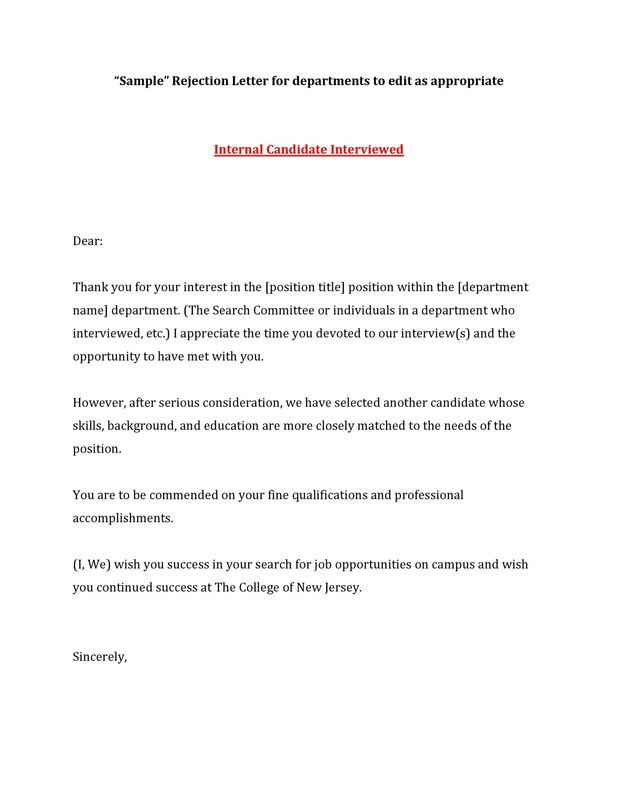 You may even have made it to the final interview. If you still get bypassed, it’s time to reconsider how you’re presenting yourself. If you receive a letter of rejection, you will get frustrated. But get over it. Indulge yourself with some guilty pleasure. Then afterward, keep doing the things that have gotten you this far.